This is a US acetate and would surely be the standard single mixes. However, the 4:38 running time of "Isn't It A Pity" appears to be an early fade. It's possible that "Version Two" was used but that version runs 4:45. This disc was auctioned in January 2005. 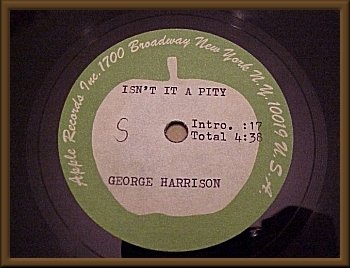 According to Chip Madinger, in Eight Arms To Hold You, "Isn't It A Pity" was originally intended as the lead single from All things Must Pass and, indeed, when the local radio stations in my area began playing the single in 1970, it was indicated that "Isn't It A Pity" was the A-side. Perhaps the 7+ minute running time was considered too long and this disc features an edit or early fade. 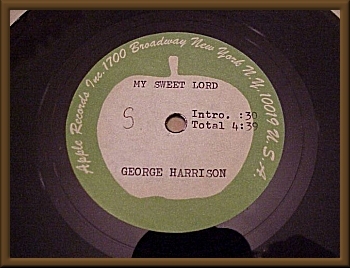 Offered here is a RARE George Harrison USA 7" Promotional Acetate. The tracks are 'My Sweet Lord' and 'Isn't It A Pity'. The disc is in Very Good Plus condition with minor scuffs. Please see the pics regarding the label info and track times. An 'S' is written in pen on both labels?